To help the Indian government achieve the national ethanol blending targets of 20% by 2017, private sugar mills and the public sector research institutes are collaborating with ICRISAT to identify and test sweet sorghum varieties suitable for ethanol production. A total of seven sugar mills are associated with ICRISAT in this 3-year project. Editor’s comment: In South Africa, DalinYebo Trading and Development (Pty) Ltd, in collaboration with the University of KwaZulu-Natal, have identified sweet sorghum varieties with a high pentosan content, so as to use the bagasse for the co-production of furfural, a high value chemical. A big mill test was successfully conducted at Madhucon Sugars, Telangana without changing any of the mill settings. The test showed a primary brix (sugar content of a solution) of 15o which is close to sugar cane. Bagasse utilization is critical in sweet sorghum value chain and one of the possible uses of bagasse is through composting. Among the ten microbial strains studied for their efficiency in composting, three strains (Myceliophtora thermophila ATCC-48104, Aspergillus awamori and Bacillus subtilis) were found to enhance bagasse composting, with more than 65% of the bagasse getting degraded within 60 days in rice straw as well as farm yard manure amended treatments. Microbial treatments enhanced micronutrient contents of the composted bagasse. The results from planting dates experiments indicated that brix content of sweet sorghum at harvest was influenced by dates of sowing, the stem girth varied with the cultivar, while plant height was affected by both dates of sowing and cultivar. The fermentation efficiency was high (>90%) for juice from two genotypes ICSV-93046 and ICSV-25306 varieties. More than 100 sugar mill staff and sweet sorghum farmers trained in the project for achieving higher yields in sweet sorghum. In the multilocation trials a new trial will be formulated by adding 4 new entries making a total of 11 entries. ICRISAT and Indian Institute of Millets Research (IIMR) to contribute the entries and the trial guidelines along with seed material. Big mill test will be conducted at Ganesh Sugars in 2016 rainy season with IIMR and ICRISAT supplying the seed. 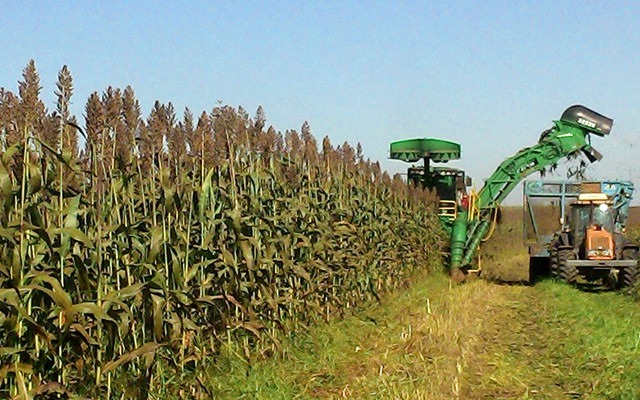 Scientists from the ARC Centre of Excellence in Plant Cell Walls at the University of Adelaide have discovered that a variety of sorghum growing wild in Australia, Arun, has the potential to yield over 10,000 litres of bioethanol per hectare annually. THE Department of Energy has finally published the long-awaited draft position paper on the pricing regulations and rules for administering biofuel prices for comment, the final step in the process in getting the potentially R15bn-a-year South African biofuels industry off the ground. From October next year all oil refineries will be required to blend 2% of locally produced bioethanol into their petrol. .. is how an investment analyst assessed one of our projects, because furfural production as part of a cellulosic ethanol plant gives the financials a boost. – 20% of the molecular carbon is lost by converting the C5-molecule in to two C2-molecules of the ethanol. – Once saccharified, there are further carbon losses associated with the typical fermentation inefficiencies of the ethanol production. + no more furfural or furfuryl alcohol that poisons the yeasts (don’t need any expensive/fortified yeasts). + allows a higher C6-sugar throughput. + furfural sales generate good profits. The above summary statements are based on our own research (2008/09), our technology developments, subsequent assessment of real pilot/demo plant data, supplied by the world’s leading cellulosic ethanol developers and a need to secure long-term furfural supplies. Furfural production delivers profitable returns on the pretreatment equipment of a cellulosic ethanol plant!